From Charleston to Morgantown, West Virginia’s cozy coffee shops are whipping up a mean cup of iced coffee. It doesn’t matter what the temperature is like, sometimes an iced coffee is just the kind of refreshing, start-the-day beverage you need. Here are our favorite spots to grab a cup. According to their Facebook page and with a goal to make “Charleston proud and Seattle jealous,” this little coffee shop is well on the way to accomplishing both. If social media reviews are any indication of the popularity of Moxxee Coffee located in Charleston, coffee lovers are treated with a friendly welcome and great coffee choices. Inside and outside seating is available. Fresh roasted coffee in mild, medium, or dark blends, lattes with or without whipped cream, caramel, or chocolate topping, and delicious cold fruity smoothies. That’s what you can expect at The Chocolate Moose in Beckley. It’s a very inviting place with its antique furniture and inviting fireplace. If you feel like adding a little thrill to your visit, try the Outside In Climbing Gym and Mountain State Miniature Golf course when you’re there. It’s fun for the whole family! A potter and a coffee roaster walked into a beard competition may sound like the start of a great story, and it would be completely true. It also accurately describes the beginning of Joe N’Throw, a unique coffee shop and pottery studio in the heart of Fairmont. But it will take a visit to see the true vision of what this place is and the commitment to community, the arts, and a good cup of coffee. 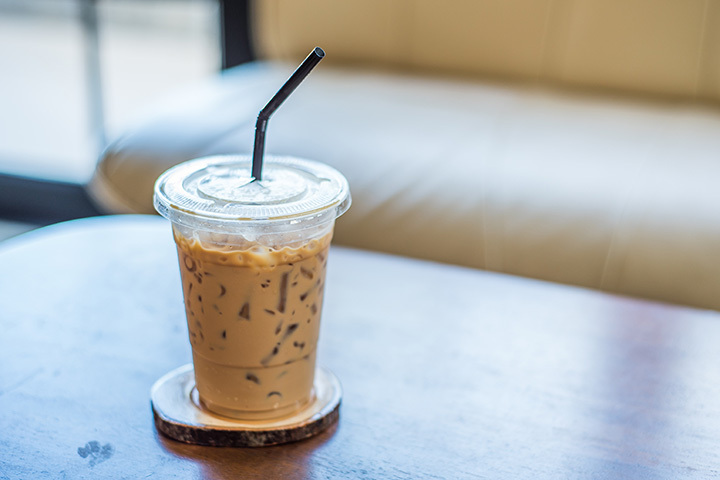 Nothing could be better to start your morning or on a hot day than an ice-cold coffee latte, chai tea, or Italian soda. For those folks who love frozen fruity drinks, The Farmhouse Café in Morgantown has those, too. Featuring coffee, espresso, and food that will make you smile, The Farmhouse is a great place to bring a friend or your favorite book. Located in Oak Hill, Top Knot Coffee and Artisan Shop is a top-notch coffee shop that promotes local artists and their creations. This one-of-a-kind shop features alpaca products, photography, and artwork created by talented folks in the community. Once you visit, you’ll be a regular and you can take advantage of the holiday drink specials and changing art displays. With a 125-year-old coffee roaster in use every day, Wheeling Coffee & Spice Co. puts the adage into practice about “if it ain’t broke, don’t fix it.” Serving up great cups of coffee, this quaint little shop offers the best cup of Joe in town with a friendly smile. The fresh brewed coffee aroma says it all. This is a must stop anytime you’re in Wheeling. They have a nice selection of blended ice drink mixes, too, so you can make your favorite at home. Great coffee starts with a fresh bean, and that’s the secret behind the success of The Black Dog Coffee Company in Shenandoah Valley. One taste and you’ll understand the difference. Another secret is that the length of the roasting time and subtle flavor combinations added by the coffee craftsmen here create a delicious hot or cold drink that will satisfy the most discriminating palate. Thomas, West Virginia may be a small town in the northern panhandle of the Mountain State, but it’s got one of the best little coffee shops around. Start your day with a hot cup of fresh coffee or espresso to go with your breakfast of choice, then come back at noon to eat lunch and have your favorite iced latte. Simple, no nonsense coffee. You’ll feel like you’re having coffee at your best friend’s house when you stop by Stonewall Coffee House in Clarksburg. This family-owned coffee shop invites you to be part of your extended family every chance you get. Stop by and smell, taste, and experience the coffee and let it become part of your daily routine. It’s a celebration of culture and good taste. Try the Stonewall Mocha with white chocolate, caramel and steamed milk or one of the frozen coffees for a special treat on a hot day. Lost Dog Coffee Fine Arts Drink Emporium invites you to tweet your secrets and taste our success in every cup of coffee made here. With a belief that making great coffee is nothing short of magic, add a little quirkiness, and stir in thoughtfulness and creativity, you’ll have Lost Dog. The Fine Arts part comes in with the local student art that’s displayed throughout the shop. Hot or cold, tea or coffee—it’s all relative to your definition of pure pleasure.